One can't talk about the heroes of fashion without discussing the importance of one of the industry's foremost couturiers, Christian Dior. Despite his late entry into the game (he showed his first collection when he was 42 years old), his designs revolutionised the way women dressed. And still does. Dior was born in Normandy, France and served as an Officer in World War II before following his dreams of becoming a designer. In 1946, after the bleak World War, he founded his couture how on the Paris' famed Avenue Montaigne and presented his ponymous collection the following year. As the story goes, the then-editor of Harper's Bazaar US, Carmel Snow, fell in love with his designs. The unique silhouettes, tiny waistlines and voluminous skirts appealed to her and, right after the runway show, proclaimed that Dior's dresses had a fresh, "new look" about them. It was then that the term "New Look" became synonymous to Dior and the silhouette he introduced. As described by British Vogue, Dior's "New Look" consisted of a calf-length full skirt, a cinched waist and fuller bust. It is a silhouette that had not been seen since the turn of the century. Dior's opulent designs was a great juxtaposition to the grim post-war reality of Europe and they inadvertently helped to re-establish Paris as the joyful fashion capital it had once been. News about Dior's revolutionary designs travelled fast across the globe and soon, the French designer was receiving requests and orders from world-famous stars which raised his profile significantly. One of them was screen legend Rita Hayworth. Dior's clientele list did not consist of just big-named stars. He was even invited to stage a private presentation of the collection for the British royal family. Despite this private showcase to the royal family, King George V reportedly forbade his young princesses, Elizabeth and Margaret, from wearing the New Look in case it set a bad example at a time when rationing was still in force. Suffice to say, Dior was the go-to couturier for the rich, famous and fabulous. In time, his designs were coveted by women of all ages and social standings. Apart from his iconic designs, Dior was a good businessman. He was the first couturier to licence his designs to be manufactured across the world, allowing him to build an empire which included ready-to-wear, accessories and beauty products. This set a precedent for other fashion houses and, pretty soon, they all followed in Dior's footsteps. 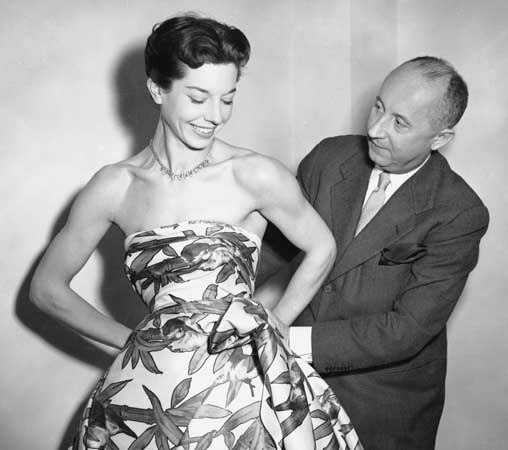 In 1955, Dior welcomed a 19-year-old aspiring designer as his design assistant. The boy was none other than Yves Saint Laurent, who would later become a fashion hero himself. In many reports, Christian Dior was said to have later met with Yves Saint Laurent's mother, Lucienne Mathieu-Saint Laurent, in 1957 to tell her that he had chosen Saint Laurent to succeed him at Dior. She said at the time she had been confused by the remark, as Dior was only 52 at the time. Shortly after that meeting, on October 24 1957, Christian Dior suffered a fatal heart attack. The fashion house was left in disarray. To maintain order, Saint Laurent was made the creative director of the house of Dior, where he remained until his conscription into the army and was dismissed from Dior. He was then replaced by Marc Bohan, who proved to be very successful as Saint Laurent's replacement. Bohan defined a new era and new silhouette for Dior, the Slim Look, which is a more modern and svelte version of Dior's iconic shape. he house of Dior underwent another change when Gianfranco Ferre took to the helm as Bohan's replacement in 1989. But it was not until 1997, when John Galliano took over the reins from Ferre, that Dior grew stronger and more iconic than ever before. On hiring Galliano, Bernard Arnault, who was CEO and managing director of Christian Dior before rising in the ranks to lead the LVMH conglomerate, said: "Galliano has a creative talent very close to that of Christian Dior. He has the same extraordinary mixture of romanticism, feminism and modernity that symbolised Monsieur Dior. In all of his creations - his suits, hisdresses - one finds similarities to the Dior style." Galliano was hailed as the fashion world's most creative genius with his fantasy-like designs for Dior. He had a very successful run as the artistic director of Dior until his fall from grace in 2011 when he was dismissed after being filmed slurring anti-Semitic remarks and allegedly assaulting a member of the public whilst heavily intoxicated in a Paris bar. Today, the house of Dior is helmed by another talented creative that is Raf Simons.